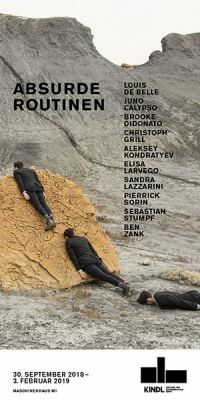 The thematic exhibition Routinised Absurdity presents works by ten international contemporary photographers who deal in different ways with daily routines and surprising breaks in them. Although the settings of the pictures seem familiar, viewers are simultaneously confronted with the unexpected and inexplicable. The highly narrative photographs not only show the absurdity inherent in mechanised behaviours, but also raise questions about the state of a performance-oriented society in which efficient action is paramount. The downsides of the constant functioning of each individual are also examined—fatigue, overwork, and collapse. The exhibition takes place as part of Berlin Art Week (26 – 30 September 2018).